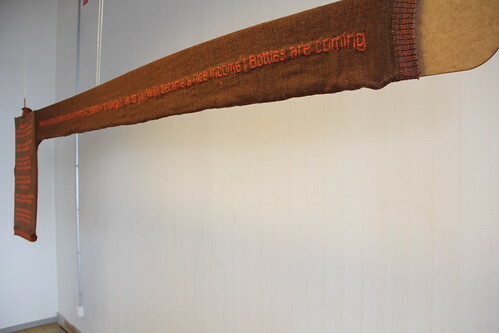 SPAMpoetry is a series of knitted works containing visual poetry from collected spam. 2. modifying an electronic knitting machine in order to give SPAMpoetry a knitted form. Concerning the concept, we are interested in bringing together digital culture and traditional handicraft. To be more specific, the idea is to experiment with the form and meaning of SPAM. 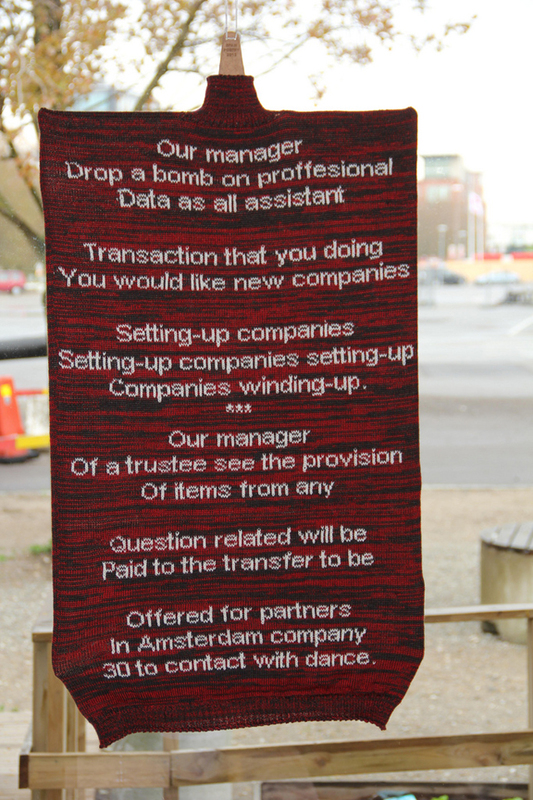 We turn SPAM into a romantic, funny or even sarcastic poetry and present it in unusual tangible form as knitted garment. To be more specific, we call final result dysfunctional wearable, because it reminds a sweater but is not really a one. Like SPAM, our dysfunctional wearable does not have a purpose. 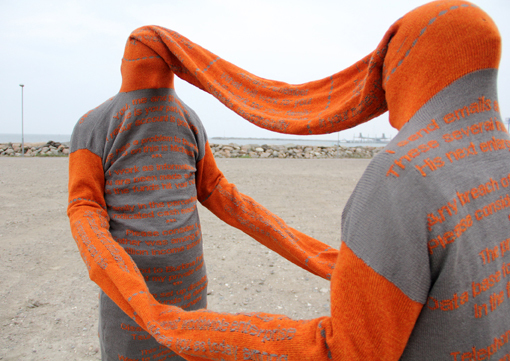 Talking about the form of artworks, one is able to recognize sweater parts in unusual position and size. Coming back to SPAM, it is generated automatically nowadays. Hence, we aim to apply the same technique for recycling it, generating poetry from SPAM algorithmically, converting into a pattern and uploading to the knitting machine. Of course, the process of knitting is done manually. 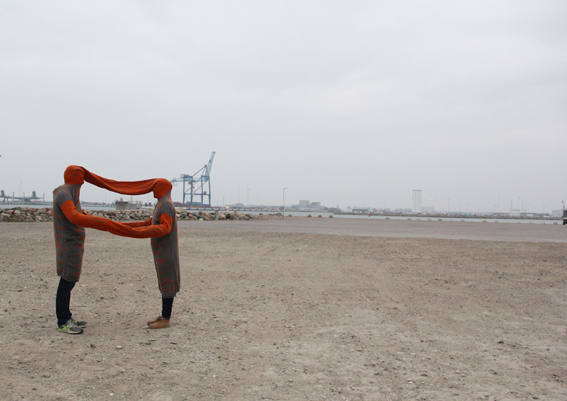 Thus, we create a contrast between rapid and overwhelming digital world and slow, careful knitting process. Why we speak about SPAM? First, SPAM generation, distribution, and reception consume a significant amount of energy that is wasted basically. Hence, with our project we aim to draw attention to this fact and find a meaning and usage for SPAM. And finally, we apply locative SPAM. In the places where the SPAMpoetry has been produced we have been collecting SPAM from locals. The works presented in this catalogue contain locative SPAM from Eindhoven and Malmö. We began working on SPAMpoetry in our artist-in-residency at MU in Eindhoven that was taking place within the framework of the M4m mobility programme, supported by the European Commission and coordinated by the Pépinières européennes pour jeunes artistes. – solo show at Maribor City Gallery, Slovenia (29th Aug – 28th Sept). See catalogue of the exhibition.